The global microbiome sequencing services market has experienced rapid growth in the last few years due to the growing support for research into genomics. The market has benefited from the growing investment being driven into the life sciences sector and particularly genetic and genomic research. Government healthcare agencies have been the prime contributor to the growth of the life sciences research sector, while private pharmaceutical and biotech companies have risen to the fore in recent year as a major contributor due to the growing economic potential of the sector. The microbiome sequencing services market is likely to benefit from the rising awareness about the utility of microbiome sequencing in understanding human health and how microbial presence affects it in various ways. According to Transparency Market Research, the global microbiome sequencing services market is likely to rise to a valuation of US$1,570.4 mn by 2022. The microbiome sequencing services market was valued at US$684.1 mn in 2017 and is expected to exhibit a strong 18.1% CAGR between 2017 and 2022. The global microbiome sequencing services market is segmented by technique into sequencing by synthesis, sequencing by ligation, pyrosequencing, Sanger sequencing, and others. Of these, sequencing by synthesis dominated the global microbiome sequencing services market in 2017, accounting for 47.8% of the global market with a valuation of US$326.7 mn. The segment is expected to exhibit an 18.6% CAGR in the 2017-2022 forecast period to rise to a valuation of US$765.6 mn by 2022. The promising growth prospects of the sequencing by synthesis segment are illustrated by the fact that its share in the global microbiome sequencing services market is likely to rise to 48.8% over the 2017-2022 forecast period. Geographically, the global microbiome sequencing services market is dominated by North America, which held a valuation of US$261.4 mn in 2017 and is likely to rise to US$619.1 mn by 2022 thanks to an excellent 18.8% CAGR. The North America microbiome sequencing services market is helped by the presence of several leading players in the global pharmaceutical and biotech sector in the region, which has enabled a smooth growth in demand for microbiome sequencing services. The widespread awareness among consumers in North America about the utility of microbiome sequencing is also conducive to growth of the microbiome sequencing services market in the region. Europe is also likely to remain a leading contributor to the global microbiome sequencing services market in the coming years, with the market expected to rise to a valuation of US$439.5 mn by 2022. Europe is one of the regions where genomics research has continued largely unhindered, which has helped enable steady growth of the microbiome sequencing services market in the region. The Europe microbiome sequencing services market is likely to exhibit a strong 17% CAGR over the 2017-2022 forecast period. Despite North America’s dominance in the global microbiome sequencing services market, Asia Pacific except Japan is likely to emerge as a major regional player in the global market in the coming years due to steady growth of the pharmaceuticals and biotech sector in the region. The APEJ market for microbiome sequencing services is likely to exhibit a 19.1% CAGR over the 2017-2022 forecast period to emerge at a valuation of US$245 mn by 2022. The global microbiome sequencing services market is likely to remain fragmented in the coming years due to the availability of diverse opportunities in the market for players of all size. Leading players in the global microbiome sequencing services market include Metabiomics Corp., Microbiome Therapeutics LLC, Microbiome Insights Inc., Rancho Biosciences, Zymo Research Corp., Molzym GmbH & Co. KG, Ubiome Inc., Diversigen Inc., Merieux Nutrisciences Corporation, and Molecular Research LP. The global microbiome sequencing services market is profiled in detail in the report with the help of detailed historical databases, which illustrate the historical growth patterns of the microbiome sequencing services market in detail. The 2012-2017 trajectory of the global microbiome sequencing services market is assessed in detail in the report in order to provide a clear understanding of the way the market has developed so far. The detailed analysis of the historical growth trajectory of the microbiome sequencing services market also provides clear markers into how the market is likely to develop in the coming years. According to Transparency Market Research, the global microbiome sequencing services market was valued at US$684.1 mn in 2017 and is likely to grow to US$1,570.4 mn by 2022 at an 18.1% CAGR therein. The report profiles the various factors driving and obstructing the global microbiome sequencing services market in order to provide readers with a clear picture of which factors are likely to have a lasting impact on the market in the coming years. The microbiome sequencing services is affected by a variety of factors, ranging from regulatory hassles regarding the techniques used in microbiome sequencing to ethical concerns regarding the key applications of microbiome sequencing services. Fluctuations in the microbiome sequencing services market are thus likely to leave a lasting impact on the market’s economic viability, making this analysis crucial for key players in the market. The analysis of how various factors are likely to affect the global microbiome sequencing services market in the coming years is vital for players looking to establish a strong position in the market, as the microbiome sequencing services market is likely to become increasingly competitive in the coming years. 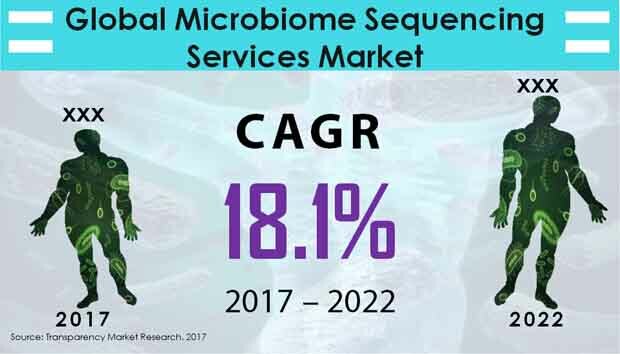 The leading segments of the global microbiome sequencing services market are profiled in the report in order to provide reader with information on which parts of the market are likely to make the highest contribution to the overall market growth over the coming years. The 2012-2017 growth trajectories of the leading segments of the global microbiome sequencing services market are assessed in detail in the report in order to provide a complete picture of the historical growth of the market as well as the growth potential of the leading segments in the coming years. By technique, the global microbiome sequencing services market is likely to be dominated by the sequencing by synthesis segment, which accounted for 47.8% of the global market in 2017. By application, shotgun sequencing is likely to remain the leading contributor to the global microbiome sequencing services market, while North America is likely to remain the leading geographical segment of the global microbiome sequencing services market. Pharmaceutical and biotech companies are expected to be the key end users for the microbiome sequencing services market due to their growing scope in emerging economies. The report provides a clear picture of the complicated competitive dynamics of the global microbiome sequencing services market to enable readers to make the most of the trends governing the market. The strategies employed by leading players in the global microbiome sequencing services market are profiled in the report to inform readers about which strategies are likely to work in the market in the coming years. Key companies operating in the global microbiome sequencing services market include Metabiomics Corp., Microbiome Therapeutics LLC, Microbiome Insights Inc., Rancho Biosciences, Zymo Research Corp., Molzym GmbH & Co. KG, Ubiome Inc., Diversigen Inc., Merieux Nutrisciences Corporation, and Molecular Research LP.